Next Sunday, for NYCFC to win the East, they would need to win their game against Columbus, the Red Bulls would have to lose in Philadelphia, and somehow NYCFC would have to outperform the Red Bulls by 14 goals. Needless to say, it would be an absolute miracle. The Red Bulls, who won last year's Supporter's Shield for top record in the MLS, overcame a 1-6 start to this season to reach this point. Red Bulls Head Coach Jesse Marsch said of whether he honestly thought after that slow start they would be in this position, "I wasn't sure. I think I said a lot publicly that I wasn't very concerned at 1-X, but I just started to wonder at what point, 1-whatever, was going to start to hurt us at the end of the year. Looks like 1-6 was about the threshold. "In some ways, I think that was the best thing that happened to us. It knocked any complacency out. It put us on our toes. It made us look carefully at things. It made us push hard every day and I think that's what's gotten us here. "So this group is on a remarkable run. I think that the confident within the group is big. Obviously it's another one of these games where we're up three and we let two back in, but you know, at 3-2, I was fairly confident that we had things under control and just trying to encourage the right kind of behavior and play to make sure that we could see the game out, so that part was good." Red Bulls midfielder Sacha Kljestan said of being at the top of the Eastern Conference after a rough start to the season, "Pretty remarkable is a good way to put it. We found ways to make the game difficult for ourselves late in games, but despite all of that, and despite the start, and despite some injuries, it's pretty great to be top of the table." Marsch said of turning points in the season, "I think there were several. The 1-6 start, I think we had a leadership council meeting where we talked in-depth about how we needed to pick things up. And to be fair those guys on the leadership counsel took a lot on their own shoulders and they said, we have to play better, and if we don't play better, then this team is not going to be any good. I think they all took responsibility. "I think after the loss to D.C., the 2-0 loss in D.C. (on May 13th), that was another moment where we had to look carefully and challenge each other to do more. And I feel like that was probably the biggest point in the season where we kind of had a break and said, all right, it's now or never. "So I think -- and it's never been about our guys' commitment or their belief. It's just about little reminders to encourage the kind of behavior from a mentality perspective and a soccer perspective to make sure that each guy is very clear with what makes him good and how to make him good within our group. The more we do that and the clearer we are with that, then I think the more I think that you see it come together." 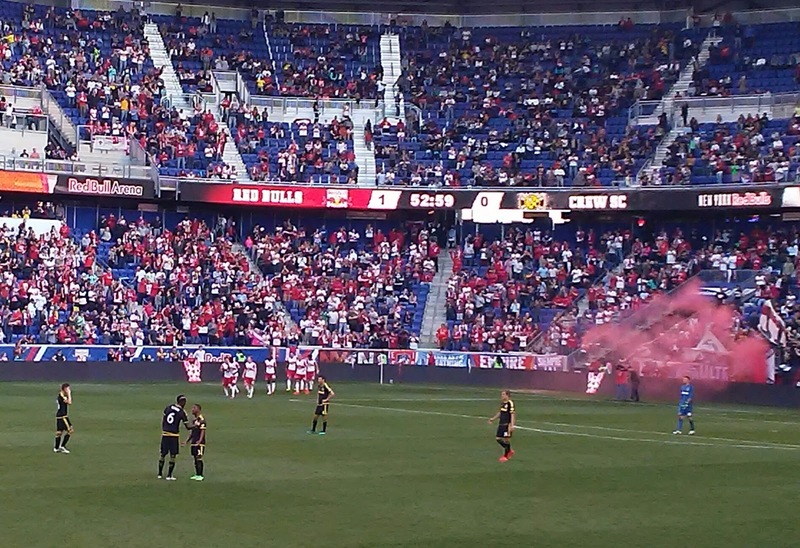 After a scoreless first half against Columbus on Sunday, Mike Grella got the Red Bulls on the board in the 53rd minute. This was Grella's first goal in four months, and Marsch said of working with him mentally and perhaps physically to get him back on that wave, "Yeah, I think with Mike, listen, obviously when he scores goals, that's a big part of being an attacking player. And I think all attacking players, it helps with confidence if they are now on a streak of scoring goals, if, for example, you look at Brad. But with Mike, just tried to encourage him to let him know that it's so many things that make him good, so many things that make our team good other than just scoring goals; and to keep him pushing hard. "Sometimes I think Mike's really hard on himself. As things maybe don't start coming his way from a scoring perspective, he starts to think too much. And so even he and I talked a little bit about the zone and players who talk about in the zone, and Michael Jordan is one of those players, right, where he said actually when I was in the zone, I wasn't even thinking. And in some ways, you know, it's not like I wanted him to start thinking but I wanted him to stop putting so much pressure on himself and I wanted him to just go out and enjoy playing. "I said in a lot of our lead-ups to games lately that Mike has been really good at training and we've seen his form pick up and he's looked really good. And I'll say that to just about all our guys, our group is fired on all cylinders and we're excited for the next couple months." Five minutes after Grella's goal, Alex Muyl set up Bradley Wright-Phillips for a goal in the 58th minute to make it 2-0 Red Bulls. 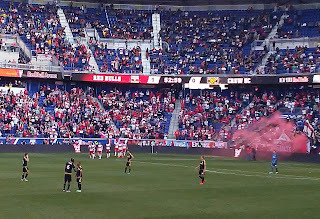 In the 70th minute, the Red Bulls had a corner kick, which was taken by Sacha Kljestan, who sent it along the touch line to Aurelian Collin, who headed it to Wright-Phillips in the box, and he drilled it to make it 3-0. This was Wright-Phillips 23rd goal of the season, as he reclaimed the lead for the MLS Golden Boot, one ahead of NYCFC's David Villa. It was also his 68th goal with the Red Bulls, as he keeps adding to his team record. Columbus put a scare into the Red Bulls late, as Adam Jahn scored in the 73rd minute and Harrison Afful scored in the 83rd minute to cut the Red Bulls' lead to 3-2. The defense tightened up in the final ten minutes to close out the victory. Kljestan said of letting Columbus back into the game, "I think we had a few chances to put the fourth goal away and at certain points of the game-we don't do it. Obviously, Columbus is a team that at this point in the season has nothing to lose, so they can throw everything they want forward without any regard for the result of the game, and they started growing in confidence as they put a few plays together. Today, it just wasn't good enough from us to stay sharp at the back." After the game, in honor of Supporters' Day, Marsch addressed the crowd about bringing home the MLS Cup and how much it would mean to them. Marsch said of balancing the top-down message from you guys down to the players, and how important it is, without maybe putting too much pressure on them taking it home, "That is the pressure. That's the reality. Our goal is to win the MLS Cup, period. So we're not afraid of that. We're not afraid of challenging ourselves to that. We're not afraid of what these games are going to look like. And in the end, it will come down to performance and come down to execution and it will come down to our ability to now push as hard as we can down the stretch. "I think we have now set ourselves up with the two years that this group has been together; that we've learned a lot, we've been through adverse situations, and we've come out on the topside many, many moments. We've played more big games than any team in the League between rivalries with New York City, Philadelphia, D.C., New England. You go down the list, right, and it feels like every week, we're in a big game and that's made us stronger and it's made us better and it's prepared us for where we're going to go." New York Red Bulls II advanced to the 2016 USL Cup Final by defeating Louisville City FC on Sunday night at Red Bull Arena. The teams played to a 1-1 draw before NYRB II advanced on PKs, 4-3. Florian Valot scored the goal in regulation, while Ryan Meara stopped two attempts in the shootout. It was the second-straight week that NYRB II required penalties to advance in the USL Cup Playoffs.